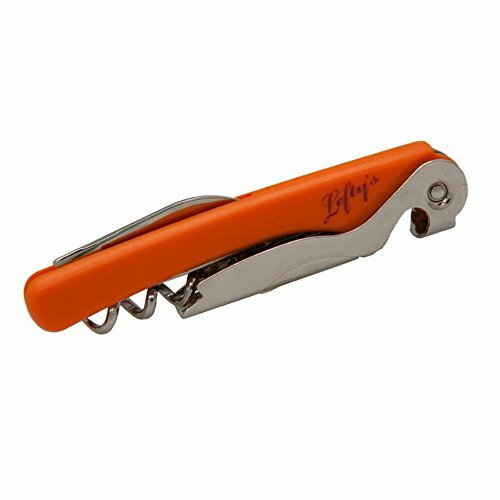 Lefty's Logo 4-in-1 Corkscrew: this versatile corkscrew comes with four different tools, a knife, corkscrew, bottle gripper and bottle opener, all of which fold into a handy and compact, 4.5 inch long, orange body. The screw rotates counter-clockwise which is much easier for lefties to use than the right-handed corkscrew which rotates clockwise. Contains four different tools, a knife, corkscrew, bottle gripper and bottle opener, all of which fold into a handy and compact orange body. Custom made exclusively for Lefty's the Left Hand Store. If you have any questions about this product by Lefty's The Left Hand Store, contact us by completing and submitting the form below. If you are looking for a specif part number, please include it with your message.